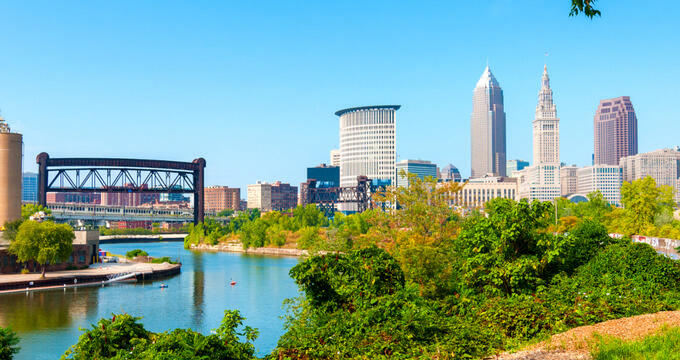 The second biggest city in Ohio, Cleveland is particularly rich in culture and history. The city boasts an impressive skyline, with several uniquely-designed buildings in the downtown area, as well as various monuments like the Rock and Roll Hall of Fame, FirstEnergy Stadium, and more. The city is located on the banks of one of the five Great Lakes of North America: Lake Erie. Lake Erie is obviously the number one spot for kayaking in Cleveland, but the lake is enormous and has many different sections with different styles of water and surroundings to enjoy. Other lakes, as well as rivers and canals, can also be found in and around Cleveland for your kayaking enjoyment, and here are some of the top kayaking spots the city has to offer. Lake Erie covers an incredible 9,910 square mile area and has a shoreline of around 800 miles, as well as several little islands to explore, with several just off the coast of Cleveland. Filled with fish and attracting all sorts of other wildlife, it’s an incredible natural wonder and a great place to kayak. Good kayaking spots around Lake Erie include Put-In-Bay island, Huntington Beach, and the Rocky River. The Flats is one of Cleveland's most unique areas. This mixed-use district has been revitalized in recent years as a vibrant entertainment destination and culturally significant part of the city, and the titular flat waters of the Cuyahoga River provide the perfect setting for relaxing kayaking sessions. Just a short drive south of Cleveland sits the Cuyahoga Valley National Park. The Cuyahoga River covers around 100 miles of ground and features a wide array of water styles from intense rapids to calmer stretches. The National Park features various launch sites and kayak rental services, making it easier than ever for keen kayakers to enjoy these waters. With a fascinating history behind it, the Ohio & Erie Canal can be a lovely location for a day of paddling. You can really feel all the industry and movement that these waters have played home to over the years, and there are some stunning views along the way. The canal runs for more than 100 miles too, so even on busy days, you can always find a stretch that isn't too crowded. If you really want to make the most of your kayaking time in Cleveland without any worries, there are plenty of great kayaking companies to be found in and around the city, serving both Lake Erie and other kayaking locations like the Cuyahoga River and Ohio & Erie Canal. These companies provide guided tours, kayak rentals, and additional kayaking services to suit every customer. Here are a few of the top rated kayak companies in Cleveland. Established in 2003, 41 North has quickly grown into one of the most trusted names in Cleveland when it comes to kayaking. Offering all sorts of kayak services from rentals to classes and guided tours, 41 North gives you everything you need and specializes exclusively on Lake Erie. Sign up with this company if you want to enjoy a kayaking adventure of one of America’s Great Lakes. One of Cleveland's top kayak rental services, River Cruiser Kayaking also runs self-led and fully-guided kayaking tours around Cleveland and the surrounding area. Focusing predominantly on the Cuyahoga River, this is a highly rated kayaking company with some excellent tours that all the family can enjoy. Located in Cleveland's The Flats district, Great Lakes Watersports offers kayak rentals at almost time of the year and day of the week. If you just want to rent a kayak and take to the water for your own adventures, this is a great place to start. Great Lakes Watersports provides low cost rentals and will also offer tips and guidance to help you find the best routes around The Flats too.